TOKYO - World shares were rattled Thursday by reports the European Union is weighing stiffer financial sanctions against Russia. A further pickup in China's manufacturing in July failed to lift markets which have been unnerved the past week by Israel's invasion of Gaza and the shooting down of a civilian jetliner over a part of eastern Ukraine controlled by pro-Russian separatists. The Financial Times said EU diplomats are considering new sanctions against Russia, including a proposal to ban Europeans from purchasing new debt or stock issued by Russia's largest banks. The report cited a memo prepared by the European Commission. The downing of the Malaysia Airlines jet, killing all 298 people on board, as heightened tensions between Russia and the West. European markets opened lower, with Britain's FTSE 100 slipping 0.4 percent to 6,774.13. 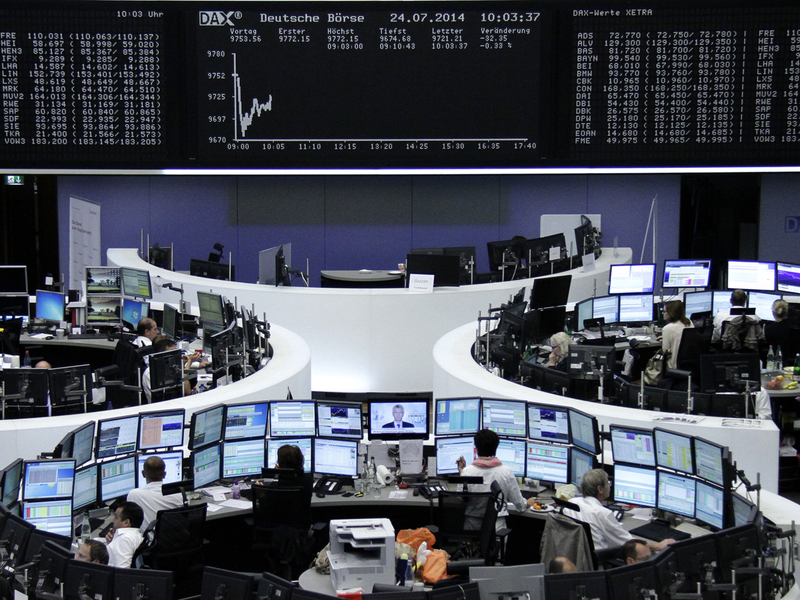 France's CAC 40 dropped 0.5 percent to 4,356 and Germany's DAX shed 0.6 percent to 9,697.87. Wall Street appeared poised for losses. Dow futures and broader S&P 500 futures were both 0.1 percent lower. An improvement in China's manufacturing provided a floor for Asian stock markets earlier in the day. HSBC's index of China factory activity rose to 52.0 in July from 50.7 in June on a 100-point scale on which numbers below 50 indicate contraction. July's reading was the highest in 18 months. China's Shanghai Composite gained 1.3 percent to 2,105.06. China's economic growth edged up to 7.5 percent in the April-June quarter after slowing in the previous quarter. Beijing is aiming for full-year expansion of 7.5 percent but has tolerated slower growth, trying to refocus the economy on domestic consumption instead of trade and investment. A slew of quarterly earnings reports will be released in coming days from major companies, including Toyota Motor Corp., the world's top automaker, and ailing Japanese electronics and entertainment conglomerate Sony Corp.
"Investors want to wait and see how those earnings turn out," said Hiroichi Nishi, general manager of equities at SMBC Nikko Securities in Tokyo. "The energy overall on markets isn't gaining much momentum." The Nikkei 225, the benchmark for the Tokyo Stock Exchange, erased early gains to slip 0.3 percent to close at 15,284.42. Hong Kong's Hang Seng was up 0.7 percent at 24,136.43 while South Korea's Kospi lost 0.1 percent to 2,026.62. Shares were mixed in Southeast Asia, with Singapore and Thailand up, while Philippine and Malaysian markets were down. In currency trading, the euro rose to $1.3468 from $1.3460 late Wednesday. The dollar inched down to 101.46 yen from 101.53 yen. Benchmark U.S. crude for September delivery was down 29 cents at $102.83 in electronic trading on the New York Mercantile Exchange. The contract gained 73 cents to $103.12 on Wednesday after data released by the Energy Department showed a drop in U.S. crude inventories that was more than double what analysts had expected.